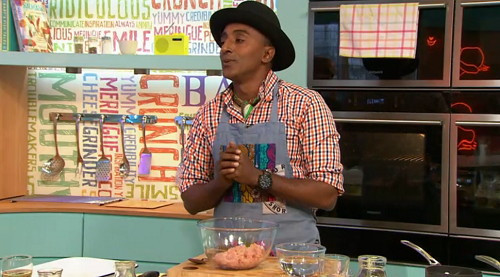 Chef Marcus Samuelsson joined Simon Rimmer in the Sunday Brunch kitchen to cook a tasty dish using a recipe from his Red Rooster cookbook for Mother’s Day. Recipes in the book range from his restaurant’s Deviled Eggs with Chicken Skin Mayo, Obama Fried Ribs, Whole Fried Fish with Grits, Curried Goat Stew, Sunday Tomato Eggs, and Uncle T’s Meatballs. He reinvents traditional home comfort foods like macaroni cheese and Swedish meatballs with exciting twists and new flavour combinations, placing them centre stage at the dinner table. Marcus’ book titled : The Red Rooster Cookbook , is available from Amazon now.